Looking for a large 32 oz or 34 oz travel mug? Want something that’s going to keep your drinks hot (or cold) a lot longer than a paper cup? There’s a bunch of options available but many are overpriced and they under-deliver. When you can buy cheap stuff from any old gas station you have to either not care about performance or not care about price. The 32oz and 34oz mugs listed on this page all are some of the best and most popular large travel mugs of their kind. Some are designed like standard mugs and have been formed to have a narrow bottom to fit many normal cup holders. Others are wide bottomed 32 oz mugs that aren’t going to be good for the road unless you have a big flat spot to set your drink down. Still other featured below follow the “briefcase bottle” design where the insulated tumbler is more of a traditional thermos that is tall, narrow, and well insulated. These usually pour out into cups rather than cater to people sipping fro the rim. In all cases however these are all best selling insulated mugs and should be perfect for many people out there. Also, make sure to see our large travel mugs page for more ideas in the larger size range. You may also want to see our page featuring 24 oz travel mugs as this is going to be the large mug group that offers the greatest variety in design. If you are looking for a travel mug bigger than 30 ounces you’ll usually run into a few common problems. Most of which has to do with the actual design of the mugs. Larger insulated mugs tend to be too big for regular cup holders, they are sometimes difficult to drink out of without pouring them first into a regular sized cup, and they are frequently too insulated. One thing I like about insulated cups is the fact that they will keep your coffee hot for a long time but the less frequently discussed problem has to do with them keeping coffee hot for too long! When you use a double wall insulated tumbler for instance there is physically more liquid in the cup and as you would expect it takes longer for a large portion of hot coffee to cool off. Even if you put hot coffee in a large bowl with no lid it would stay hotter longer than it would in a regular sized coffee cup. Bigger portions are simply better at retaining heat than smaller portions so your insulated containers will be even more effective. This sounds great on first look but when it comes time to drink your coffee you will sometimes face situations where you have to remove the lid to help the temperature come down to a drinkable temperature. For me I like the bigger insulated mugs that don’t claim to keep your coffee hot all day because it’s easier to actually drink coffee from them on a day to day basis. After all removing the lid to lower the temperature defeats the purpose of using a sealed tumbler in the first place. If you are like me then go for some of the lower cost 32-ounce mugs featured above (or below) and also consider picking up a top of the line thermal coffee carafe that can hold your coffee at full temperature all day long. I have a page here on the site dedicated to just carafes that keep coffee hot all day long and you might not realize this but even the best carafes can be cheaper than some of the best performing large travel mugs. Insulated carafes sometimes have less complicated lids and they are handy to have around the house anyway for times when you are brewing tea for yourself or for guests or for storing your french press coffee after brewing it. My favorite insulated carafe is the low cost Hiware thermal carafe but you can see a few other top carafes here on the blog. There’s just too many options for travel mugs and tumblers. But it would help to know the basic types and kinds out there. 12 oz travel mug – This is equal to 1 ½ cup of coffee. Good for single serve if you want more than just a cup, or good enough for two people to share. 16 oz travel mug – This is equal to 2 cups of coffee. Perfect for coffee lovers who want enough coffee to last for half a day. This is also good for sharing. 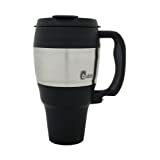 24 oz to 34 oz travel mug – This is perfect for camping or spending time outdoors. It can serve 4 to 6 people. Stainless steel travel mugs – This is a popular choice among users because of its durability and ease of cleaning. Stainless steel is highly resistant to absorbing taste, odor and stain. When taken care of properly, it can last for several years because it does not rust nor corrode. Ceramic travel mugs – Ceramic mugs look traditional home mugs. They are dishwasher save, easy to clean and can keep coffee warm for at least an hour. It is more affordable but less durable. 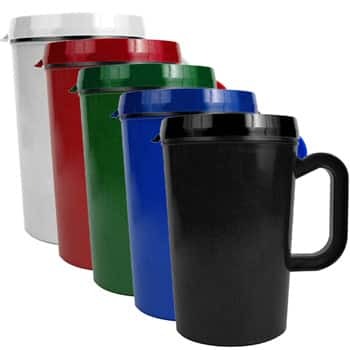 Plastic travel mugs – Like ceramic, plastic materials are inexpensive. But it is more durable than plastic, less breakage and dents. It is easy to clean but plastic can retain and absorb stain and odors very quickly. 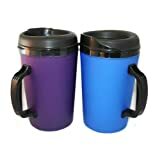 Double-wall/insulated travel mugs – This is the most loved type of travel mugs because of its excellent heat retention quality. Some insulated travel mugs can keep coffee hot for eight full hours! It is also highly durable, easy-to-wash. Some insulated mugs can be very expensive, but given the features, it is worth the investment. When will I use the travel mug? Is it for daily travels? Is it for camping and outdoors? Is it for family gatherings and parties? What is the perfect size for me? Will it be for personal use or for sharing? How much is my budget? Am I willing to add a few more dollars if the tumbler I want costs higher than my budget? Or am I willing to sacrifice some features and stick to my budget? What if you have chosen a specific kind of mug, say a 34 oz travel mug? How can you find the one that suits you best? Bubba is known for its quality and affordable travel mugs. If you are looking for a huge mug that’s built to last, you will get your value for money with Bubba Classic. ThermoServ offers very affordable travel mugs. These large models are perfect for outdoor activities. It can efficiently hold hot and cold drinks for hours. Thermos is a popular brand for food and liquid temperature management. If you want a travel mug that efficiently holds hot or cold drink for the longest time, choose Thermos. It’s huge size is a plus factor since you can store coffee good for six people. Best vacuum insulation technology that promises to hold cold or hot beverages for 24 hours!